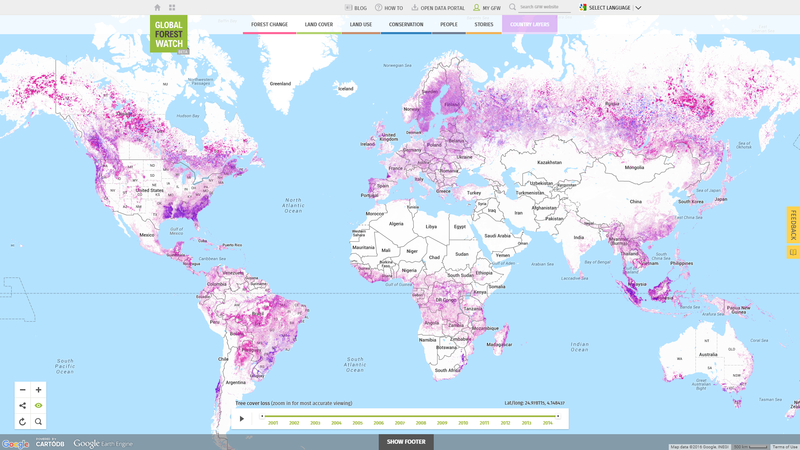 Global Forest Watch (GFW) is free and simple to use, enabling anyone to create custom maps, analyze forest trends, subscribe to alerts, or download data for their local area or the entire world. Users can also contribute to GFW by sharing data and stories from the ground via GFW’s crowdsourcing tools, blogs, and discussion groups. Special “apps” provide detailed information for companies that wish to reduce the risk of deforestation in their supply chains, users who want to monitor fires across Southeast Asia, and more. GFW serves a variety of users including governments, the private sector, NGOs, journalists, universities, and the general public. Stay informed and sign up for GFW e-mail updates. Engage with us and our community; send us an e-mail or connect with us on Twitter. Global Forest Watch is managed by a diverse and growing partnership, convened by the World Resources Institute. See the full list of GFW partners at globalforestwatch.org/partners.